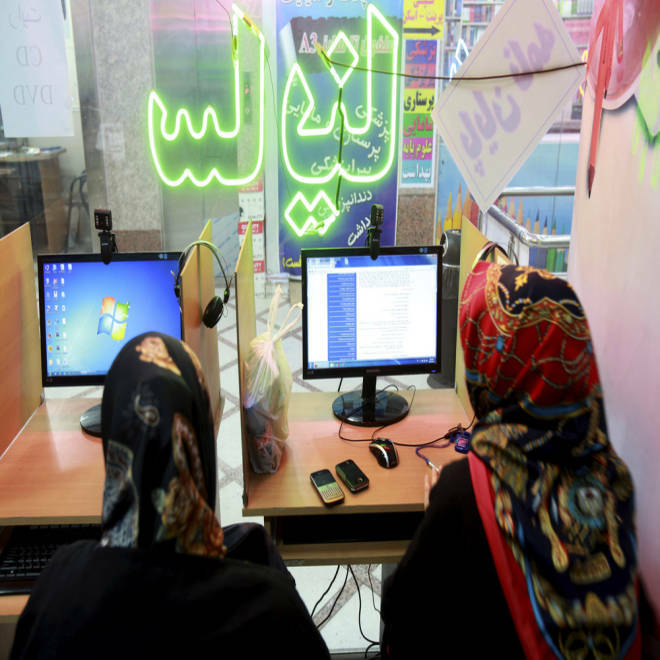 Two Iranian women surf the Internet at a cafe in Tehran, Iran, in September, when authorities briefly lifted blocks on social networks and then restored them. Google hopes a little browser tool will help change the world. The company that revolutionized Internet search is now unveiling a sort of online underground tunnel — a way for people in restrictive countries like Iran and Syria to get around digital censorship and surveillance. The idea behind the tool — essentially a button for browsers — called uProxy, is simple: People in countries such as the United States provide their trusted friends a secure connection so that they can see and use the unrestricted Internet. Google showed it off earlier this week at a conference called “Conflict in a Connected World.” Google also rolled out technology to map cyberattacks around the world, including by repressive governments. The innovations, from a division of the company called Google Ideas, come at a time when the Internet, and social media in particular, is playing an increasing role in popular upheaval around the world, most notably in the Middle East. Iranians surf the Internet at a cafe in Tehran, Iran, on Sept, 17, 2013. The joy of Iran's Facebook and Twitter fans was short-lived as authorities restored blocks on social networks after filters were lifted for several hours overnight. 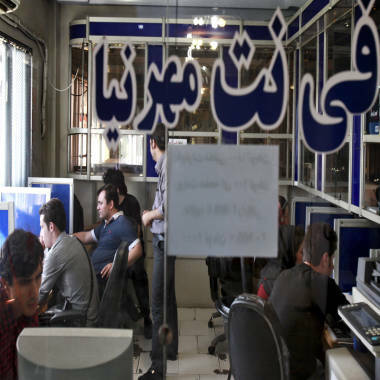 The brief access was a "technical glitch" that was quickly rectified, according to communications official Abdolsamad Khoramabadi, from the board overseeing Internet in Iran. “These are going to be useful additions to the activist toolkit,” said Philip Howard, a professor at the University of Washington who has written about the impact of social media on political change. In the two-year civil war in Syria, efforts by opponents of President Bashar Assad to inform the world were met by “unrelenting online repression,” according to the free-information group Reporters Without Borders. Iran has intensified surveillance and jammed Internet lines during periods of unrest. China has censored touchy keywords, including “democracy” and “human rights.” Similar but smaller repression took place during uprisings in Egypt and Tunisia. And just in June, Turkey tightened its grip on Twitter, which it accused of helping people spread lies about the government and terrorize society. It also sought to target “provocateurs” on social media, without giving details. The uProxy tool essentially provides a mask for dissidents. They can establish a secure connection with someone across the world, in a free-Internet country, whom they trust, and read and post online without surveillance or blocking. Chinese citizens already use similar connections to get around what is known as the Great Firewall — the government’s blocking of much of the Western Internet, including social media sites. In an initiative called Project Shield, Google is also offering to host websites that come under politically motivated shutdown attacks. That initiative is still in testing but has already been endorsed by a popular Persian-language news website. Google, a company with a market value north of one-third of a trillion dollars, says it’s about free expression, not a business interest — in fact the projects are targeted toward many countries under economic sanctions. It’s an interesting move because Google, at least its Ideas division, “sees censorship as Internet damage and wants to route around it,” said Danny O’Brien, executive director of the Electronic Frontier Foundation, a nonprofit digital rights group. The drawback is that it may lead countries to target Google more explicitly, he said. The tool deliberately avoids Google servers, he said — individual computers act as the middlemen, getting packets of information from repressive countries like Iran and China out to the world. “But if you put a big Google label on a service like this, you might expect to get blowback,” said O'Brien. A Google spokeswoman declined comment on this concern. Howard, from the University of Washington, cautioned that getting around Internet censorship is not as simple as building a virtual tunnel. Whether Google’s ideas have an equal impact in all repressive regimes remains to be seen, he said. The Chinese government, for example, has negotiated special treatment from search companies before, and has plenty of money and power to build its own Internet tools. And Russia has poured money into keeping the Internet from being free there. During the Arab Spring, he said, “We saw how a handful of democracy advocates could use digital media to catch dictators off-guard.” But it wasn’t long before governments figured out how to use social media for surveillance and censorship. “It’s a running battle,” he said. He cited the uproar over National Security Agency surveillance programs and doubts about whether the Google initiatives could further open the door for the United States to gather information.